Most of us wouldn’t want our Facebook friends solely responsible for our workout mixes or birthday party tracks. However if you happen to be friends with those in the music know, then you might make a case for using an app like EQuala. If your friends are using a Facebook-connected music streaming player like Spotify or Rdio, Equala pulls this data from Facebook to feed you, the listener, a selection of music that your friends are enjoying. Sure, there’s some risk – but if you’re desperate for some new tunes, it could be just the ticket. Unlike apps like Twitter #Music and Piki that only allow you to listen to samples for free, EQuala’s CEO Lior Aharoni says the company works with SoundExchange, holds a contract with Media Net (to have access to over 24 million songs), and operates under the DMCA Radio License so you don’t need Spotify, Rdio, or other music players to play music for free through EQuala. Of course what this means is that you can’t actually select the music you want to listen to, and as expected you get a limited number of skips per hour – six to be exact. If you want to listen to specific tracks, you’ll have to fall back on the conventional music streaming services. As for the listening experience itself, sometimes you’ll find a track that’s worth listening to beginning-to-end but many times you’ll find tracks you’ll skip over instantly. EQuala pulls everything your friends have listened to and algorithmically figures out how much of a match their music listening habits are to yours to signal who’s worth following and who isn’t. So what you listen to in your music player really all depends on who you choose to follow – which certainly seems more productive than Spotify’s Follow function, a seemingly random suggestion list. Regardless, I ended up skipping songs rather frequently from my very friends that EQuala recommended highly. This however may change over time as I get a better sense of what types of people I want to follow on EQuala. You will have to put up with ads if you want to use EQuala. Every five songs, an ad pops up; they last for 20 seconds or less – a fair trade for free music, really. You can also pay for a premium subscription to remove the ads altogether. From the start, EQuala presents you with a list of users and a percentage to indicate how much their taste in music matches yours. The algorithm revolves around a “Music DNA” – an analysis of a user’s music listening habits. From there you can choose who to follow and who not to follow. Remember that since you’ve connected your account to Facebook, EQuala knows what you’ve listened to as well, and the app uses that as a benchmark to figure out your Music DNA. For example if you take a look at my Music DNA, you’ll find that I listen to Rap and Hip Hop 82 percent of the time, Alternative and Indie 13 percent of the time, and Rock 3 percent of the time. What EQuala does to get a better sense of your music taste isn’t too different from what Pandora does, but EQuala’s strategy is far simpler, more transparent, and powered by your social network. How accurate is EQuala’s matching algorithm? Though I was skipping quite a few songs, EQuala says that this and other factors will actually help the services matching algorithm do its work. “By interacting with less than 20 songs, the system’s matching accuracy is lower because it has a less comprehensive understanding of the users’ listening habits,” says Aharoni. There’s also a function called “shouting.” Shouting songs is kind of like you’re tweeting your favorite songs. 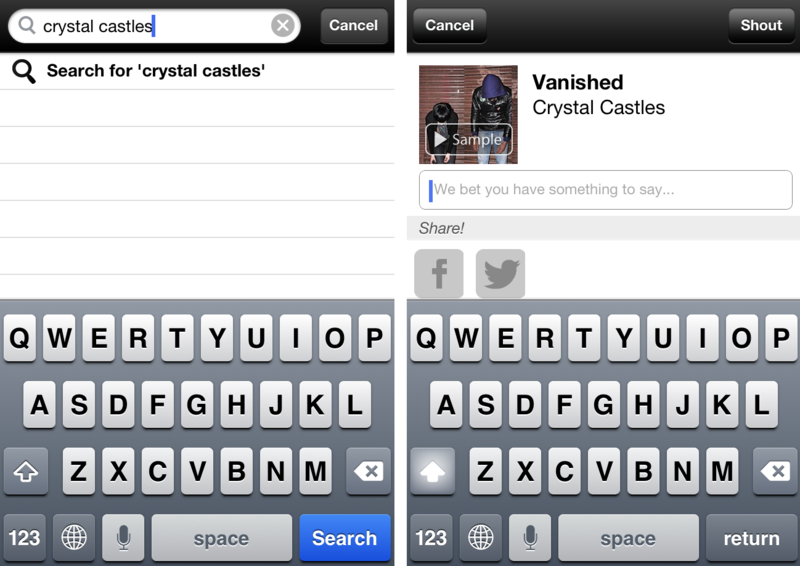 You can search for certain tracks or artists by tapping on “Music Search.” By shouting selected tracks you’re adding the track to your profile so that your followers will be able to listen to those shouted tracks in their music stream. Unfortunately this doesn’t mean that you can listen to your own shouts. If you’ve taken to EQuala after first use, it might be worth sitting down and shouting your favorite 20 tracks to give EQuala more data to work with and to better recommend other users to you. Of course you’ll need to do your own part to improve your music listening experience. It’s up to you to follow the right people since they’ll end up being your DJs. 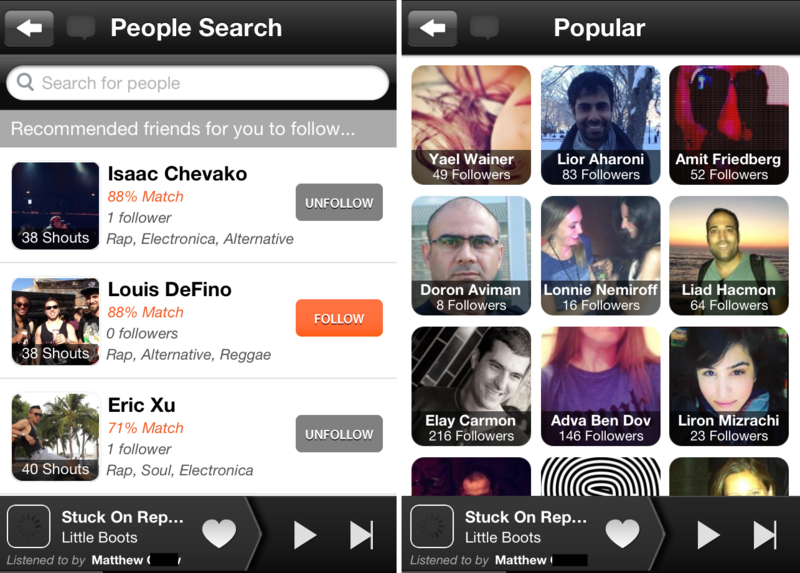 “Popular” has some UX shortcomings. 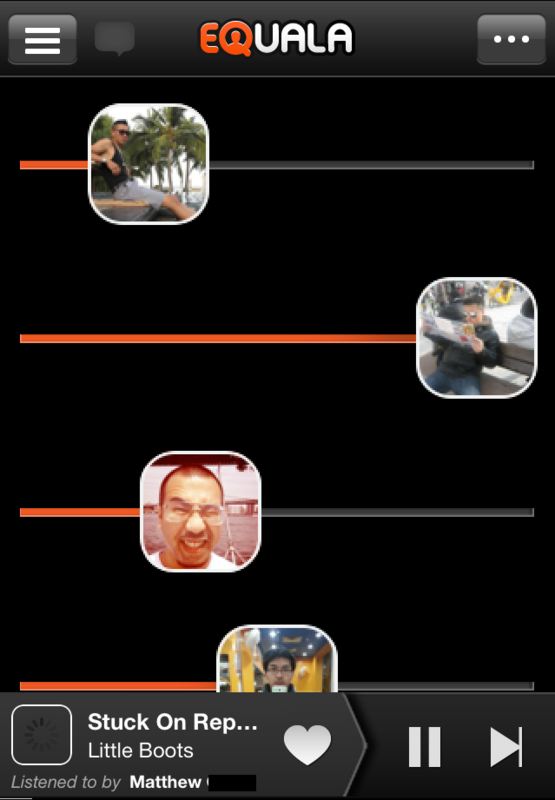 The page is filled with a list of a user’s profile pictures, names, and their number of followers. But there’s no indication of what these people listen to and how relevant they are to me so it’s almost as if I’m expected to know what these users’s musical taste is off the bat. 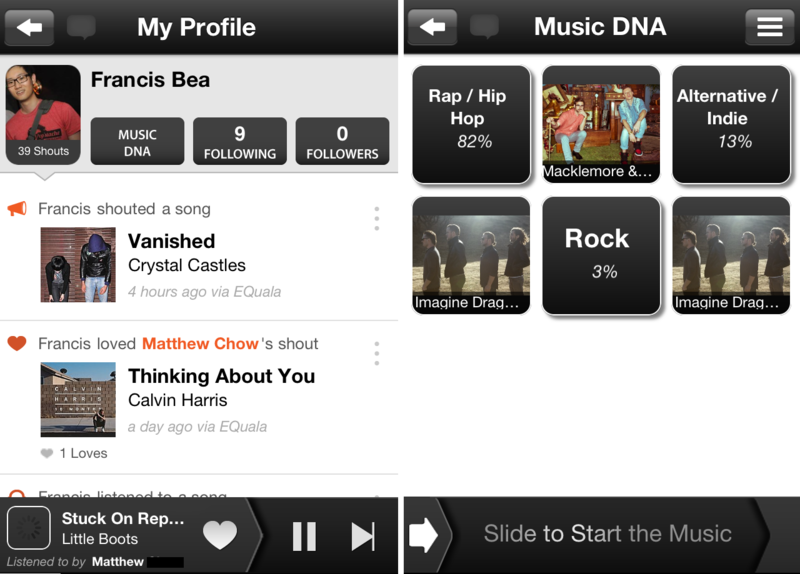 But with a little extra legwork, you can click through to each user’s profile and find their Music DNA. 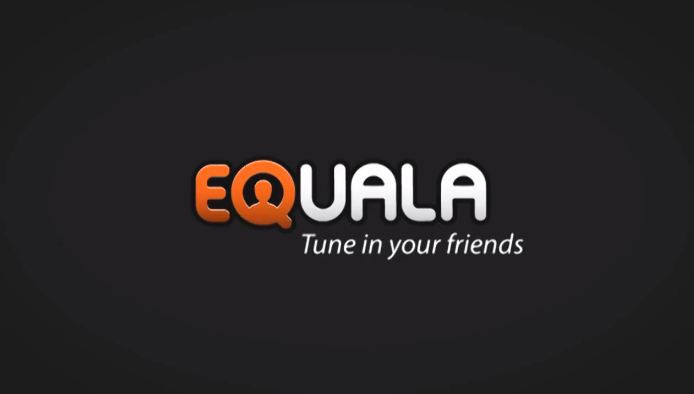 EQuala could do far better if it incorporated genre-based “radio” stations instead of forcing users to follow other people, but we’ll have to wait for that. Here’s the thing about EQuala and social listening: It’s not perfect. After browsing through my friend’s music, even those who were an 80+ percent match had surprisingly different music tastes than I did. Since this is a problem, one that EQuala I suspect is well aware of, the app comes with a nifty little feature called the “Equalizer.” The app allows you to select how much or how little of each user’s music taste you’d want surfacing. Say you’ve found someone you musically relate to; just slide their Equalizer to the far right so you’ll hear more from them. Slide them to the left, and you’ll hear less. It’s easily one of the distinguishing features that sets EQuala apart from other apps. There are a crop of apps like EQuala, and it remains to be seen whether there’s a market for these types of radio, music discovery apps or if they should just exist as features to the larger players like Spotify, Pandora, Rdio, and the like. I can see how an app like EQuala might be embraced; you can source new music from friends that have a very similar taste in music as your own, at least theoretically. Unfortunately this isn’t necessarily true in practice. 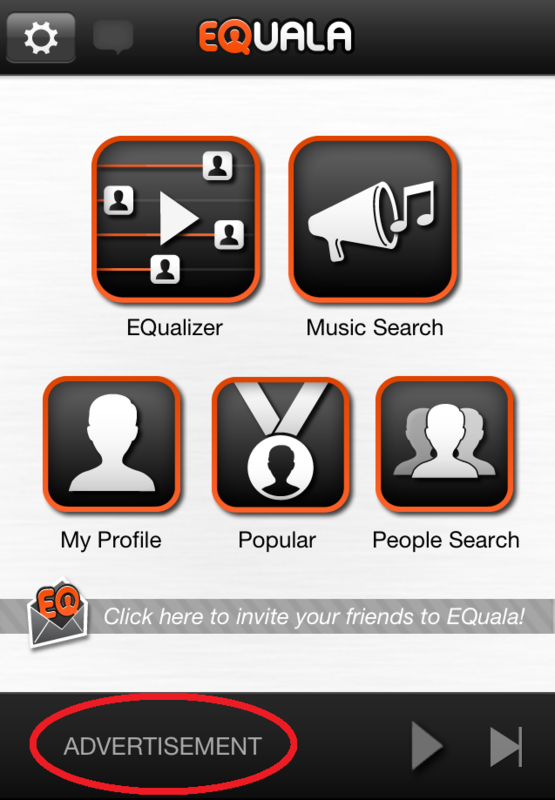 EQuala alone isn’t to blame; apps like Piki and even Twitter #Music have their flaws. Even though I do end up discovering new music, I find myself skipping tracks quite frequently – and there’s the trade off you have to be willing to make.